Designed for everyday use, and it is a safe and effective fly repellent for horses, ponies, and dogs. Contains 0.2% pyrethrin. Effective for hours. 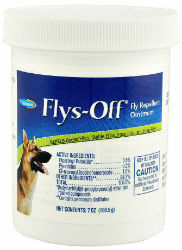 Protects wounds, open sores, and scratches from disease-carrying flies. Repels house, stable, face, and horn flies. Kills flies on contact. Ideal for use on ears and facial areas. Not to be used on animals under 12 weeks of age.